What are those bright objects hovering over the horizon? Planets — and the Moon. First out, the horizon featured is a shoreline of the Atlantic Ocean that occurs at the Galicia National Park in northern Spain. Next furthest out, on the left, is the Moon. Easily the brightest object on the night sky, the Moon here was in only a crescent phase. The next furthest out, on the right, is the planet Venus, while planet Jupiter is seen at the top of the triangle. The long exposure from our rapidly rotating Earth made all of celestial objects — including the far distant stars — appear as slight arcs. The featured image was taken last Sunday night. Although the Moon’s orbit has now taken it away from this part of the sky, the planets Venus and Jupiter can be seen superposed just after sunset until mid-August. 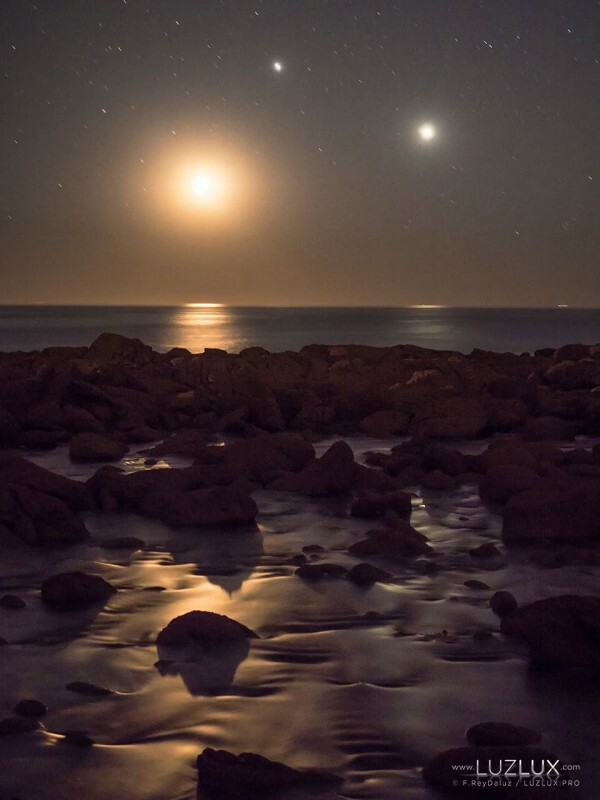 The closest apparent separation of Venus and Jupiter will occur in one week, when the two planets will appear separated by less than the angular diameter of the Moon.